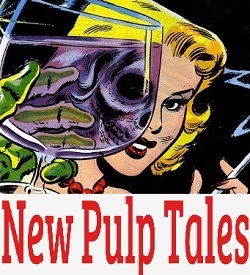 New Pulp Tales publishes weekly story installments harkening back to the golden era of magazine storytelling. 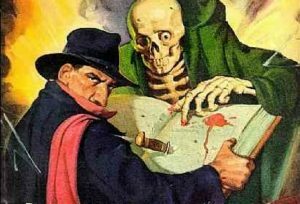 The website was born as a result of Chinese food and a Heidi Ruby Miller class on the rising genre of New Pulp. Like-minded classmates in Seton Hill University’s Writing Popular Fiction Master’s Program joined together to create a web platform where they could create original pulp tales for a modern audience. Eric Skowronski writes fantasy, sci-fi, and mystery. His website, www.ecskowronski.com is currently under construction but will hopefully be complete soon. In his spare time, SJ Langland dreams up what wonders and horrors he can, masquerades as an author, and desperately hopes people don’t figure out the ruse. Ralph Weld writes mystery, sci-fi, and fantasy. He is married to a woman who thinks he might be a little odd. They now have one dog who is in charge of their daily lives and are searching for another rescue. Check out his website at www.ralphweld.com and follow him on twitter @RalphWeld.